This section is divided into two parts covering the basic tools you really must have, followed by those that are worth having and which you may soon move onto. By then you will have your own ideas about what would suit your needs and a browse through a tool catalogue or a visit to a tool shop will show you what is available. Any tool is an investment – the right tool is a better one. If there is space on a wall a cabinet provides ideal storage for tools and they are more accessible than they would be in a box or chest. The doors should be deep enough to accommodate saws and larger shallow tools. If each tool has its position marked on its rack, it will be easy to stow correctly. Allow for possible alterations later if the kit changes. You need to be able to measure and an extending rule that goes up to 3m (10ft) will do. The simplest measures just as well as one with an expensive case. With it you should have a straight steel rule, probably 30cm (12in) long. This will be used for a straight edge as much as for measuring. 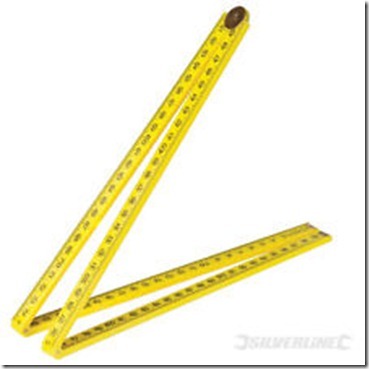 For marking right-angles a small try square is the usual tool – all steel rather than wood and steel. An alternative is a combination square, with a head for right-angles and mitres, sliding on a rule. It may also include a spirit level and a scriber, but these are not so important. You may have a household hammer which can be used. If you buy one, get a Warrington-pattern weighing about 190g (8oz). This has a cross-pein opposite the flat face. A wooden handle gives much less shock on your wrist than a metal one. Nails do not always go in straight, so get a pair of pincers. 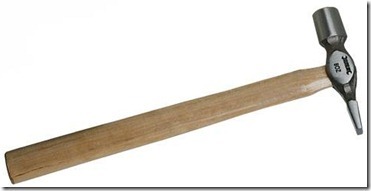 A claw hammer works with large nails, but pincers will work with all sizes. You will need several screwdrivers, but start with one about 30cm long overall, which should suit average-size screws. Similarly, you will need many chisels but start with 12mm and 18mm firmer chisels, preferably with bevel-edges. You probably have a knife with a point, but if you buy one, the Stanley type with replaceable blades is particularly useful. There will have to be a general purpose hand saw. Get one with about a 50-cm (20-in) blade length. It will have cross-cut teeth, but will also do some cutting along the grain. 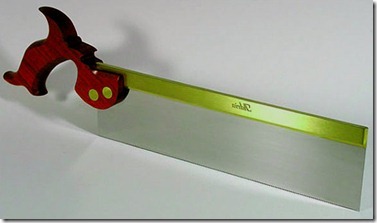 A fine-toothed tenon saw with about a 25-cm (10-in) blade length is suitable for bench use. A brass back looks nice, but the cheaper steel-back saw cuts just as well. The first plane should be a steel smoothing plane, such as the Record or Stanley No. 4. It is not meant for rough wood, nor for straightening a long length, but, set to a coarse cut, it can follow a saw. The plane and chisels will have to be sharpened, so you need an oilstone, about 20 by 5cm. There is no need to buy a case – you can make that. There are combination stones, with coarse grit one side and fine the other, which allow you to deal quickly with a nick due to hitting a nail and finish to a sharp edge on the fine side. If you buy oil, get thin lubricating oil, but paraffin or any thin oil will do. For making larger holes in wood there is nothing to take the place of a brace. If you can afford a ratchet type you will appreciate its value in more advanced work. Centre bits are cheapest, but they do not suit deep drilling. It is better to get bits of the twist type, such as Irwin, as they drill deeply as well as in thin wood. Make a start with three different sizes under 25mm. For screw holes a simple and cheap tool is a bradawl. With these tools you can do a lot of good carpentry. Other tools can be made or improvised. Providing you keep your projects reasonably small or only work with prepared timber, you may surprise yourself with what you accomplish. Screwdrivers are made in many sizes to suit different sizes and types of screw head. Apart from the plain screwdriver. There are ratchet and pump-action types which can make screwing easier. It will soon become obvious that some other tools are desirable, although what you want next may not be the same as another carpenter. It depends on the work planned. A larger try square is needed for checking and marking panels, so one with a 30-cm (12-in) blade is worth having. For very large work, make a set square with a piece of plywood. 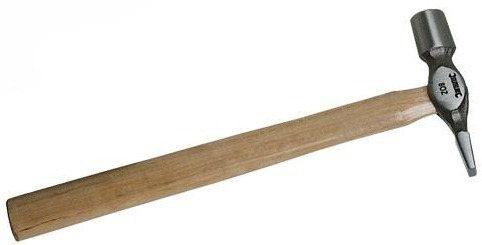 Chisels are better hit with a mallet than a hammer, so get a carpenter’s mallet, although any shape of mallet will do. If you want to do substantial woodwork, you will appreciate a second and heavier hammer. A claw hammer of good size is probably the best choice. Screws really need matching screwdrivers to drive properly without damaging the heads or surrounding wood. Several more plain screwdrivers to suit gauge 4 to 10 will be needed, but if you expect to do much screwing you might consider a pump-action screwdriver with several different size bits. However, there are places where you cannot use it, and you will still need some plain screwdrivers. Get or make one or two nail punches. Extend your range of chisels as you find the need for other widths. If you want a gouge, get a 12-mm (1 in) paring one. The second plane should be a jack, which will do roughing and straighten edges better than the smoothing plane. A block plane is useful for cross-grain and trimming edges. If you are doing shaped work, the cheapest satisfactory saw for curves is a coping saw, and the tool for cleaning the edge may be a spokeshave, but a Surform tool, with flat and curved blades, may be a belter buy as it is more versatile. A pair of strong dividers, about 25cm (10in), are useful for spacing, as well as for drawing curves. 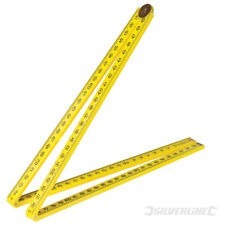 For marking angles other than a right-angle, the tool to have is an adjustable bevel, about 20cm (8in). Another fairly cheap marking tool worth having for making lines parallel to an edge is a marking gauge – the simplest is all you need. Get some G cramps. The 15-cm (6-in) type is suitable to start with. As you progress you will find you cannot have too many of these. Other cramps may follow, but some can be improvised with wedges. You will want to add to your stock of brace bits and include a countersink. For smaller holes use the Morse-pattern twist bits, originally intended for metal. Cheapest and satisfactory for wood are those described as ‘jobbers’ bits. To drive them get a wheel brace with a 6-mm (j-in) capacity chuck. 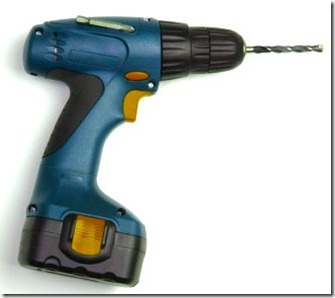 Even if you get an electric drill, this will still have many uses. 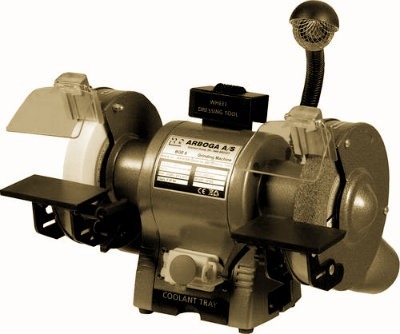 With the development of small electric motors has come the introduction of many portable, powered woodworking tools, and a newcomer reading the advertising may feel that nothing can be done without buying most of them. Throughout the history of carpentry, craftsmen have done most of their work with hand tools. Some of it was laborious, but the quality was good. In general, power tools should be regarded as a means of lightening labour, although they may help ensure accuracy as well. Without doubt, an electric hand-drill is the most useful supplement to hand tools. A chuck capacity of 9mm (fin) is better than 6mm (1 in) and a speed adjustment is worth having – wood drills better at a higher speed than metal. The same drills, up to 6mm, can be used for wood and metal. Above that size you will need special power bits for wood. A bench stand allows the drills to be controlled so holes are made square to the base. Some bench stands can be used with the drill horizontal. Among other things this allows a lathe assembly to be powered by the drill, but do not expect to do any large turning this way. A disc sander can be mounted in the drill chuck. This is useful for some shaping, but it is not a finishing tool. Some of the other attachments available should be considered against buying the same thing with its own motor. A jigsaw is one of these. But the one with a built-in motor is easier to use accurately than the attachment on a drill. A jigsaw has a short stout saw projecting through a base plate. A reciprocating drive moves it up and down rapidly and it cuts on the up stroke. This is the tool for following curves or straight lines in wood up to about 25mm thick. 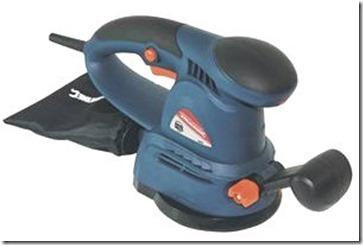 A portable circular saw, either self-powered or to fit on a drill, has limited uses. Another portable tool that might be considered is a router. A cutter rotates at high speed and is guided to do such things as mould edges and cut grooves. Whether it is worth having or not depends on the work to be done. An orbital sander, which can be either self-powered or attached to a drill, is used for finishing a wood surface. But on an average-size job, you may get the same result by hand sanding with no great expenditure of effort. 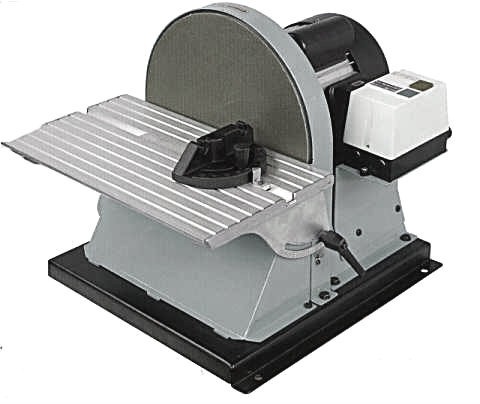 A small double-ended, high-speed grinder is useful for sharpening blades. But care is needed to avoid drawing temper by over-heating the tools. Workshop. The circular saw blade projects through the table. A height-adjustment controls the depth of cut while a fence on the table ensures that, in the width, the wood is correctly positioned in relation to the blade. A small underpowered saw tends to be frustrating. 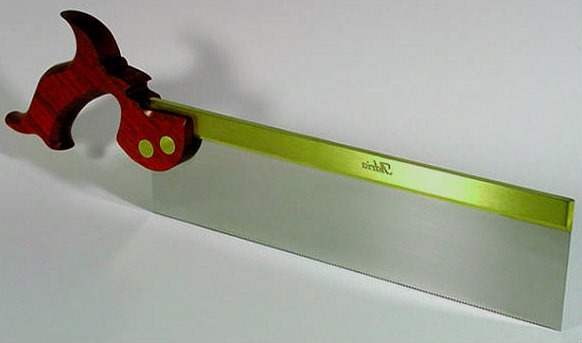 One that will make a 50-mm (2-in) cut allows you to cut down wood to size from your stock of larger pieces. It can also make grooves or cut rebates, using the height and fence adjustments. 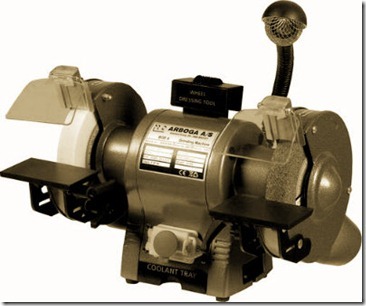 Next in popularity is a planer or jointer. Like the saw, it should have a useful capacity and enough power. A cylinder rotates at high speed and carries two cutters. Adjustable tables are used to feed the wood over these. Most planers can be set to cut rebates at the side and some have a ‘thick-nesser’ built in or to attach. 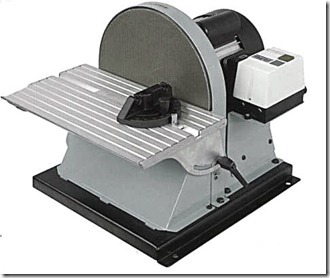 There are several machines with a circular saw and planer driven by the same motor. All of this is convenient, but useful sizes are expensive. Small low-powered assemblies are probably more trouble than doing the work by hand. A bandsaw is a good static tool for cutting curves. The continuous blade goes over two or three wheels. The furthest it can cut from an edge is the distance between the saw and the frame. This is a more accurate shaping tool than a jigsaw. It will also make straight cuts. Because of the continuous action of the saw it will cut quite thick wood – 10cm (4in) may be the capacity of a small machine. Anyone interested in boatbuilding or other work that involves many curves might find this a more useful tool than a circular saw. To have a satisfactory capacity a wood-turning lathe needs to be fairly big. Whether one is obtained or not depends on the degree of interest in wood turning, but it is possible to obtain a lathe with other functions at the headstock end. 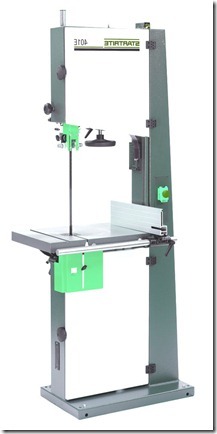 There can be a circular saw, planer, belt sander or mortising attachment. Capacity of these items is not as great as other independent static machines, but they are still useful sizes. With combination machines of this type, you have to allow for the time it takes to dismantle one attachment and add another, which may not matter if one setting is needed for many operations, but could be a nuisance for a series of single cuts. Cutting tools, such as chisels, have to be ground occasionally. This may be done elsewhere, or you can have an electric grinder, with one or two 15-cm (6-in) grinding wheels. Other machines do not revolve fast enough, so putting a grinding wheel on an arbor to mount in a drill chuck, may have some use in grinding tools, but the comparatively slow speed causes rapid wear of the wheel. Check that the power cable is away from the cutting edge, of adequate size and with undamaged insulation. It should also have an earth wire unless there is an indication on the tool that this is unnecessary. Have the work fixed and keep both hands on a portable tool. Keep guards in place and check tightness of chucks and adjustments. Do not lock on a switch intended to be hand-held. Make sure you have a clear view throughout the cut. Keep clothing out of the way. There are numerous power tools available to reduce the effort involved in carpentry. 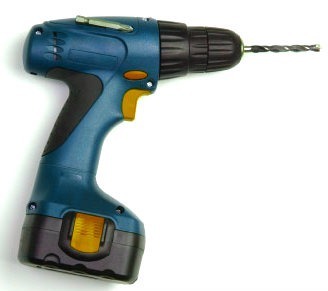 The power drill (bottom) is probably the most common tool. And for the enthusiast, a jig saw (top), power saw and power plane are all handy pieces of equipment. Although some light woodwork can be done on the kitchen table, it is easier to work accurately on a substantial bench, which is essential for heavier and more advanced furniture. It is possible to buy benches, some of which are quite elaborate, but it is often necessary to fit a bench into available space. Quite often the bench can be built into a part of the workshop and this aids in giving it rigidity. However, there is often an advantage in keeping the bench free-standing, so it can be moved about and you can work all round it. Bench hook hardwood (a 300 by 75mm section would do). Under this is an apron to support it and provide an upright bearing surface for anything in the vice. Both of these parts are best made of beech. Hardwood is advisable for other parts, but many of them could be softwood. Sink screw heads below the surface and cover them with wooden plugs. The vice should be fitted with wooden aws, and one of these should be let in flush with the apron and the bench top. Holes for pegs further along the apron allow wood extending from the vice to be supported. Behind the working surface there are thinner boards forming a well to hold tools, but at the back there is a ledge standing up to the same height as the front to give a bearing surface for wide pieces of work. A strip of wood across acts as a rest for planes. The simplest bench stop is a piece of hardwood through the top and bearing against a leg, so it can be knocked up and down as needed. Sawing on the bench top is best over a bench hook, made of beech or other hardwood, with one piece cut back so the saw is used over it and does not drop through and mark the bench top. Dowel the parts together. A pair of sawing stools, at knee height, is worth having for sawing on or supporting things such as complete sheets of plywood. The traditional method of construction is shown, but there are special metal brackets obtainable to join the legs to the top. An alternative is a ‘Workmate’ workbench, which can be set at knee height, or higher, and has adjustments so it can be used as a vice or cramp in several ways, or as a small bench for some things. It is still worth having at least one sawing stool. Other useful equipment of plywood will check large right-angles. A wooden straight edge will rule and check longer lines. Templets for dovetails, leg shapes, special angles and mitres can be made and kept to help in later projects. If much picture framing or other construction with mitres is planned, it is worthwhile having a guide for the saw. There are metal guides available, but the traditional mitre box can be made in the form of a trough larger than anything to be cut, with slots cut with the saw to be used, square across the centre and at 45° each side of it. The ‘Workmate’ bench provides an adaptable work surface that functions as a vice and a clamp as well as a bench or sawing stool at several heights. An expert woodworker keeps his tools in good condition. A less-skilled worker tries to carry on after a tool has become blunted and begrudges sharpening time. A cutting tool with a good edge produces a better finish and is less likely to cause an accident than a blunt one which requires more force to make it work. Apart from each tool working better, efficient tools encourage you to do better work. The long grinding bevel on a chisel or plane iron is made by holding the tool at a steady angle to a revolving grinding wheel. But the sharpening bevel at the end is made by rubbing along an oilstone at a constant angle. Then a few rubs flat on the other side completes the sharpening process. Clean tools in good condition encourage good workmanship. Besides keeping edge tools sharp, metal parts may be kept free of rust by rubbing with emery cloth and metal polish. Stored steel tools may be wiped with oil. Wood parts can be sanded and varnished occasionally and benches and cupboards should be kept free of dust and shavings. Most woodwork is done with tools designed to cut with a paring or slicing action. Chisels, gouges and plane irons are those needing most frequent sharpening. If their edges are examined, all but the thinnest ones will be seen to have two bevels. The longer bevel is made on a grindstone and should be at about 25°. The other bevel – the sharpening bevel – is made on an oilstone and has an angle of about 35°. Grinding is done on a grindstone. A large slow-turning sandstone wheel with water dripping on it is the traditional type, but a smaller high-speed electric grinder may have to be used. Care is needed to avoid over-heating, which will draw the temper of the tool and leave it soft. Remove the tool frequently from the stone and dip it in water to cool it. Grinding is only necessary at long intervals when the sharpening bevel has become very long. 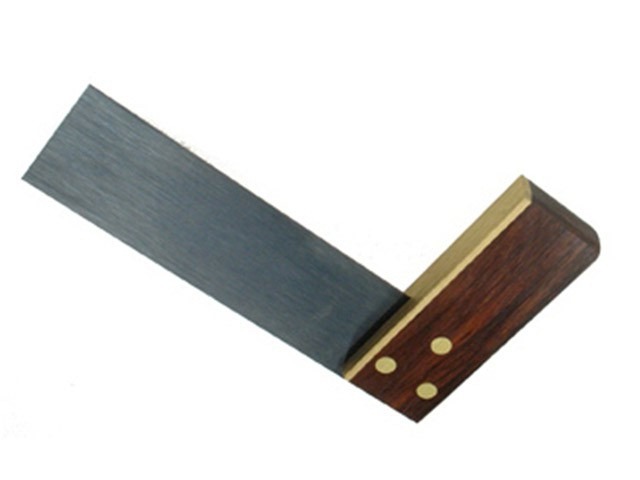 Sharpening is carried out on an oilstone fixed in a vice or lodged on the bench so that it cannot move. The flat surface should be kept clean and lubricated with thin rather than thick oil. Hold the chisel or plane iron bevel-downwards. One hand takes the handle or top of the blade to maintain the angle and provide thrust. The fingers of the other hand apply pressure just behind the cutting edge. Use most of the length of the stone and try to keep a constant angle by swinging your body as well as your arms. Wipe the edge clean and examine it. If the surface being rubbed has obviously not yet reached the edge. Continue sharpening. If it appears to have reached a thin edge, feel the other side. A particle of steel that has been rubbed away, but is still clinging, may cause a roughness. This is called the ‘wire edge’ and indicates sharpness. Rub the other side of the blade flat on the stone a few times and finally slice the edge across some scrap wood to remove the wire edge. If the tool being sharpened is narrow, move it about on the stone to avoid wearing a groove in it. 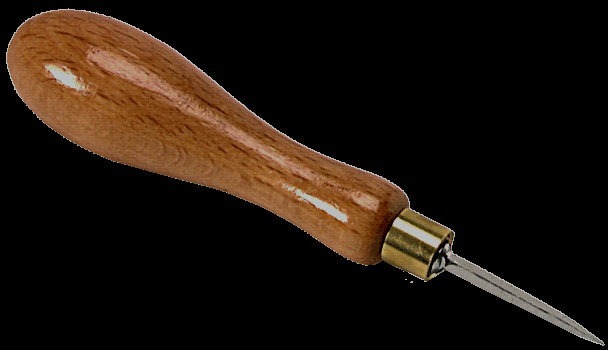 Gouges can be sharpened on the outside by rolling at the same time as rubbing. Insides of gouges are sharpened with an ‘oil slip’, which is a narrow oilstone with a rounded edge. Remove their wire edges in the same way as chisels. Woodworking bits control the size of the hole with the outsides of the cutters. So any sharpening should only be on the inside. A bit intended for use in a brace can have its cutters sharpened with a small, fine, flat file, to give a cutting edge in the direction of rotation. A high-speed, flat bit intended for use in an electric drill cuts in a different way. Its outer side should not be disturbed, but the two cutting edges can be revived by rubbing with a file. Knives are sharpened in a similar way to chisels, with one hand controlling the angle and fingers of the other hand pressing, but the angles are the same both sides. Pointed tools should be rolled and moved about as they are rubbed along the oilstone. Of the many gouges and chisels, only those used for carving are given a bevel on the second side. Cutting tools with shaped edges are sharpened like planes, but they may need special stones to match them. In any case sharpening is on one side only and the wire edge has to be removed by rubbing flat on the other side. A screwdriver turns a screw better, and is less liable to slipping off the screw head, if it is kept straight across the end and with even bevels. The steel is soft enough to be shaped with a fine. Flat file, although an oilstone can be used if necessary.